Well I had coolant seaping from the wheep hole on my water pump. Couldnt find anything on how to change the seals on here so I took a bunch of pictures while doing it. It was really easy everything was in the manual just not the greatest for pictures. Hope this helps some of you guys out. Sorry some of the pictures were a little blurry. It was easy enough to just copy and paste P/N's instead of looking at a fiche. Align the coolant drain valve to the "on" turn to the left till you feel it click now your ready to drain. Once she is all drained out you want to remove the water pump assembly remove these allen bolts. I found it easier to remove the cover then the pump assembly. It wont just fall off you gotta work it off. It will come loose just the gasket holdng it on there. After that there is another snap ring to remove then you can pull out the impeller and shaft. Giving you acess to the seals and bearing. After the impeller is removed I was able to pull out the rubber mechanical seal and didnt realize there was an outside metal piece around this seal thats "tightly fit" into the housing. So no need to remove that rubber like I did youll be able to tap it out together as one piece. I used an aluminum punch to tap out the bearing in the direction of the picture above. Cam out pritty easy. after that is removed you can remove the black rubber seal from behind the bearing with a hook pick. Once you get the bearing and the black rubber seal from behind the bearing out you can flip housing over and use the punch to tap out the mechanical seal. Now get the new mechanical seal out. I used a 1" socket to tap it into place with the mallet. You can use a vise or C-clamp if you prefer but just tap it in as even as possible. then install the new seal underneath bearing then tap bearing into place with mallet. A socket will probably work well for this also I did not use one. Last seal is on the impeller shaft. Use a small flat head to pry it out and then install new seal. Now youll want to remove whatever is left of the gasket on the crankcase try your HARDEST not to let pieces fall into crankcase or coolant passages. Install new oring's on the 90* tube then install new gasket and pump assembly with the 90* tube on the assembly before you install it on the crankcase. Thats it hope this helps atleast one person out! That was great, Thank you, very nice of you to take the time to help others. Great job. +1 on the vote here too. Better late than never, thanks for the guide. I need to replace the seals in my pump now, its leaking. Looks pretty easy. I am wondering if the Bearing can be salvaged if removed carefully? The bearing is going bad and why it's leaking. I've been planning to do this. So thanks from me too. Sean, Thanks for getting my parts in the mail post hast, honestly you knew i needed the parts about 10 minutes after I notice the pump was leaking. In my book that should be plenty of time. LOL Hopefully this will be the last maintenance issue i will have before the Texas rally in less than 2 weeks. Looking forward to riding with you in Eureka. I'll be doing this soon. Great write-up. awesome write up, just got mine disassembled last night. my seal between the mechanical seal and bearing was pretty garbled up. also make sure you clean the weap hole. mine was full of crud. the mating surfaces for the mechanical seal were full of goop too. 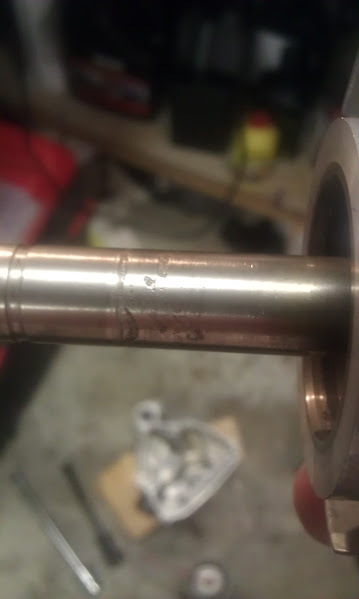 1. hows this impellor shaft look? i was surprised to see those divots in it. 2. being used to sealed pre-greased bearings is the bearing that goes on here normal to feel the 'rolling' when spinning it? i didn't check it before I installed it (but i guess should have) but now that its i can feel the balls spinning. Like almost notchy but not really. not sure if i'm just used to pre-greased sealed bearings. i sprayed degreaser in the old bearing and it also feels similarly but i don't trust it as i drove it out via its inner race. the new one was driven in with a flat surface, can't see how i'd damage it honestly. that was my feeling on the bearing. its lubicated with oil though as its on the crankcase side of the oil seal. good point on the impeller. it makes sense, no need to do the job twice.